The beautiful Greek island of Skopelos is part of the Thessaly region in the western Aegean Sea. It offers a more relaxed Greek experience than its neighbouring islands, with a hilly landscape blanketed by pine forests and a few quiet resorts dotted along the coast. This saxophone-shaped island has long been famous for its fine wine. According to legend, it was founded by Staphylos, the son of the god of wine, Dionysus. The port is one of the prettiest in Greece, with a cluster of terracotta-roofed white buildings, a Venetian fortress ruin and quaint chapels scattered on the hillside. Once ashore, lose yourself in the steep narrow streets of Glossa, where you’ll stumble across charming seafood restaurants serving freshly caught fish and local olive oil. Or spend your afternoon trying to find the island's 360 chapels, the oldest being the 11th Century Basilica of Agios Athanasios in the Kastro area. The Bakratsa Museum in Skopelos Town is housed inside an 18th Century mansion, featuring a range of fascinating medical tools and clothing from the era. Another noteworthy stop is the Folklore Museum, which features a traditional style wedding room, bridal bed and outfits. Although the coastline lacks long stretches of white sand, it is still very pretty. Milia beach in the southwest is arguably the most attractive, with a small, pristine pebble and sand shore. 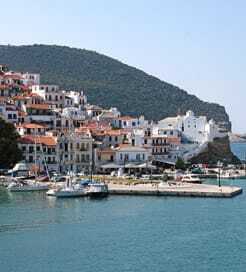 Skopelos is well connected to the surrounding Sporades Islands and mainland Greece. There are frequent, high-speed ferries every day from Alonissos and Skiathos, as well as frequent crossings from Agios Konstantinos and Volos on Greece’s east coast. The two ports in Skopelos are in Glossa in the northwest and Skopelos Town in the southeast.